Ships operating an inert gas plant have discharged process water from open loop scrubbers in the port area for over 50 years. No studies have been published that indicate measurable harm to the marine environment. Nor has the operation of open loop scrubbers at numerous facilities on land such as power station shown to be detrimental to waterways or the environment. In fact, Asia has adopted flue gas desulphurisation (FGD) for several power stations. They include Mawan (1.8GW) in Shenzhen, Guandong province, China, Tanjung Bin (2.1GW) in Malaysia, Paiton (1.4GW) in Indonesia, Manjung (2.1GW) in Malaysia. The FGD installation at Mawan has been listed in China’s “Cross Century Green Project Plan” and the “Blue Sky Project” programme by the government of Guangdong Province and is regarded as a model by the Chinese National Environment Protection Bureau for other seawater flue gas desulphurisation (SWFGD) projects. Around the world there are over 50 GW of General Electric (Alstom) installed sea water scrubbing systems for FGD. The General Electric (Alstom) sea water scrubbing process has been recognized and approved by several environmental agencies around the world. In the working draft of the European IPPC Bureau’s Council Directive 96/61/EC on Integrated Pollution Prevention and Control, Alstom’s SWFGD is included as a BAT (Best Available Technique) and described under “3.4.1.2 Seawater Scrubbing”. As the 10th anniversary of the founding of the EGCSA approaches, it is gratifying to report around 1,000 globally trading ships have fitted or ordered exhaust gas cleaning systems (EGCS). The figure amounts to 100 ships per year of EGCSA’s existence or about 5 ships per year per EGCSA member. Clearly the larger companies have the lion’s share of the installations and order book but nevertheless the dogged persistence of EGCSA members will now hopefully provide a return to their investors, no matter the size of the member company. It will not be super-profits. The shipping industry has been spoilt on low cost ships and equipment for too long. That will have to change in a world where steel work will in future have to be complimented by sophistication if the industry is to meet the raft of new environmental requirements. 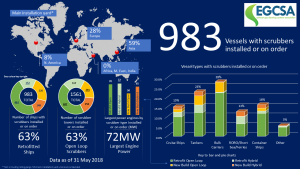 A survey of EGCSA members has revealed that scrubber uptake is rapidly accelerating with the number of ships with exhaust gas cleaning systems installed or on order standing at 983 as of 31 May 2018. This follows a slew of recent reports that major ship operators, including Spliethoff, Frontline, DHT and Star Bulk have opted for scrubbers. One of the ‘big’ container companies has confirmed it will use scrubbing as part of its 2020 compliance portfolio and there are rumours that others will do likewise. Until relatively recently the largest installed exhaust handling capacity has been for engine powers in the region of 25 to 30MW. However, the latest data shows that this has been well and truly exceeded by a retrofitted hybrid system for a 72MW container ship engine. Large capacity scrubbers are not confined to retrofits as the maximum size new building installation is a hybrid system for a 65MW engine. The IMO Pollution Prevention and Response sub-committee (PPR) has set up a correspondence group to provide guidance in the event of accidental breakdown, instrumentation malfunction or perceived non-compliance of exhaust gas cleaning systems. Part of the group’s brief is to clarify some of the language used in the scrubber guidelines (MEPC.258(68)) including the term PAH (polycyclic aromatic hydrocarbons) monitoring. So, what are PAH and why are PAH monitored? Well, quite simply these are a group of compounds found in oil that can be measured in water at parts per billion concentrations. This enables monitoring of the extremely low levels of oil in scrubber wash water, which is well beyond the measurement capability of traditional instruments associated with 15ppm or even 5ppm bilge water separators.